Family-friendly ski slopes — RandallAnthony Communications Inc. Some of Brad and Tanya Pelletier’s fondest family memories have happened in the snow and cold. Skiing is one of the few activities their clan of six, with kids ranging in age from eight to 15, can enjoy together. So getting on the slopes together is a priority, and Big White Ski Resort is one of their favourite places to ski as a family. “We wanted to come to a place that not only supported our family but also had great quality of snow,” says Ms. Pelletier. “At Big White, the family could ride the lift together and often enjoy the same run down,” says Ms. Pelletier. There are beginner and intermediate runs off each of the resort’s eight main lifts, and most also include expert runs. Off the slopes, the resort – a 50-minute drive from Kelowna – is equally welcoming. Almost the entire village of condos, townhomes, hotels and chalets is on-slope. The Pelletiers could slide right out the door of their condo building in the morning and then ski to within steps of it at the end of the day. The condo building where they enjoyed their skiing holiday had its own pool, hot tub, game room and cinema. Nearby were plenty of indoor and outdoor non-skiing activities, including an area with miniature snowmobiles, ice climbing, tubing and a family-focused chalet. The amenities at the resort are within walking distance or a short shuttle ride away, so the family didn’t need a vehicle during their stay. “It was very easy for us to do what we needed to do as a family and then go off and do things we needed to do individually,” says Ms. Pelletier. But Big White isn’t the only resort making skiing for families – with their range of ages, interests and abilities – easier and more fun than ever before. Another good example is Kimberley Alpine Resort. The quiet resort means short lineups, which translates to more time skiing the Mascot Trail, a kids’ roller-coaster run full of twists, turns, banked corners and rolling jumps. Families can save money and avoid cafeteria crowds at the Kootenay Haus, the mid-mountain chalet dedicated to the DIY lunch crowd with pay-by-donation coffee and a deck that offers spectacular views over the Columbia Valley. And at the end of the day, parents can enjoy a beer from the Trickle Creek Lodge deck without ever losing sight of kids skiing solo on the beginner-friendly Owl T-bar right out front. What makes Panorama Mountain Resort especially family-friendly is its compact village. It’s small enough for kids to wander it on their own, and everyone can get where they want to go without calling Mom’s taxi. Most of the accommodation that isn’t right on the hill is close to the free gondola running from the bottom of the village right into the resort’s base area. It makes it easy for older kids to find their own way to the skating rink, the Candy Cabin (an on-slope candy shop), the largest slope-side hot tub in Canada or to the Mile 1 Express chair for night skiing. For parents, Panorama Mountain Resort hosts the only heli-skiing operation that flies right from the resort every day with RK Heliskiing based in the village. And there’s a regular shuttle down into the nearby town of Invermere for supplies or browsing the galleries and boutiques. One of the best ways to get to the know Whistler Blackcomb is with Family Private Lessons, which groups a family with one instructor. Learning and exploring the resort creates shared memories, and when the day is done Whistler Blackcomb’s friendly village has a range of activities from trampoline parks to climbing walls, bars and restaurants, and many spa and shopping options. Things are a little simpler at family-friendly Whitewater Ski Resort. For a long time it was a local ski hill, the place where Nelson residents taught their kids to ski. Despite the resort’s growth in recent years, it retains its small-town feel, where everyone looks out for everyone else, especially the kids. And even with its modernized lift network, including a new chairlift this year, the ski hill is easy for kids to navigate. At Kicking Horse Mountain Resort, snow school instructors are always ready to keep kids entertained, safe and improving their skills with lessons for all levels of ability. For families visiting for a week during spring break, there are also week-long kids’ camps. With the same instructor and group of kids every day, the consistency leads to faster improvements, and often new friendships are forged while everyone is having fun. Sun Peaks is designed to cater to all abilities – with beginner to advanced ski runs on every lift – perfect for families. There are bumps and jumps along almost every run, sure to keep kids of all ages entertained. The terrain park is also a favourite among kids and teens, and offers options for varying levels of ability. The park progresses from easy to advanced features that are clearly identified. Parents can ski the park with their kids, or alongside the park. They may want to join in the fun with some of the non-intimidating features. Best of all, you can finish off a day on the mountain by skiing into the village and stopping at the chocolate or candy shop to reward yourself for a day well spent! At Revelstoke Mountain Resort, the Kids’ Centre is the headquarters for all things kids, with a climbing wall, foam pit, toys and more. During the day, it’s the base for daycare and kids’ lessons. On select evenings during the week, it’s the après-ski focus for kids from six and up. Nightly activities range from arts and crafts to games, tubing and movie nights. 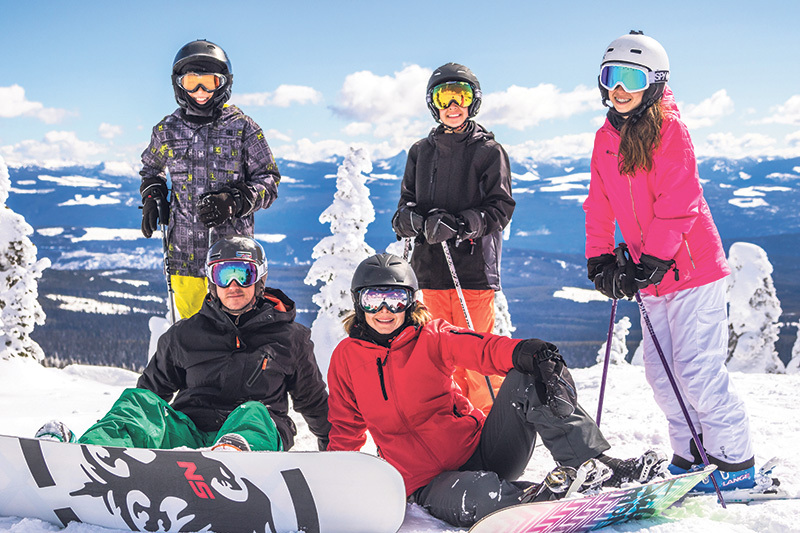 Families with teenage children have plenty to choose from at Fernie Alpine Resort. The adventurous can bond over an afternoon spent snowmobiling where guided tours lead groups into the nearby mountains along roads, trails and into untracked bowls. A balm for sore ski and snowmobile muscles is Spa 901, named one of Canada’s top 25 spas in 2016 by the Canadian Spa and Wellness Awards. In the town’s historic 1908 former school house, a 6,600-square-foot wellness centre includes treatment rooms, a hot pool and plenty of pampering. Finally, and maybe the best reason to plan a family ski holiday, is the value for money. Many resorts package accommodation with lift tickets and airfare. B.C.’s third-largest ski area, SilverStar Mountain Resort is celebrating its 60th anniversary this year and is offering big savings in March and April. Beyond ski and stay packages, the deals extend to spa discounts and the chance to win a 2018-19 season pass for the whole family. Where’s there’s snow there are opportunities to ski together and make memories – and there’s plenty of snow at B.C.’s many resorts.